I’m ready to watch the playoffs. 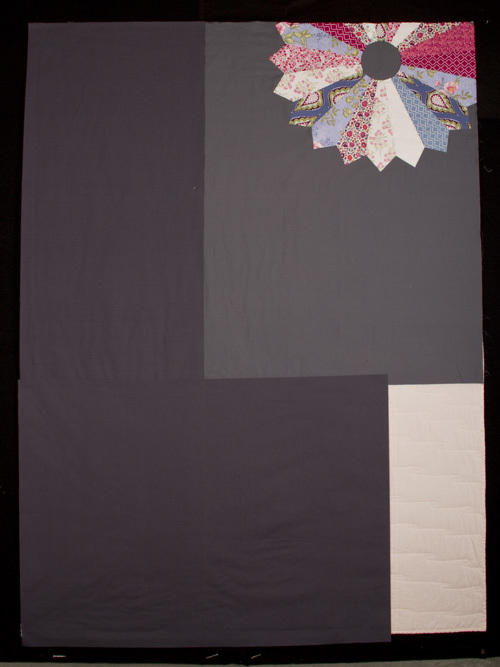 I can’t sit and watch TV without a project to work on, so I’ve got this quilt all prepared for hand applique. 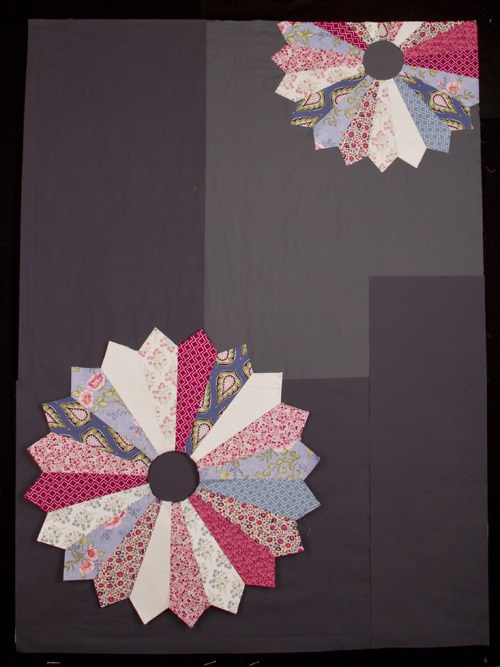 I pieced the background the other day, and last night I basted the flowers down. 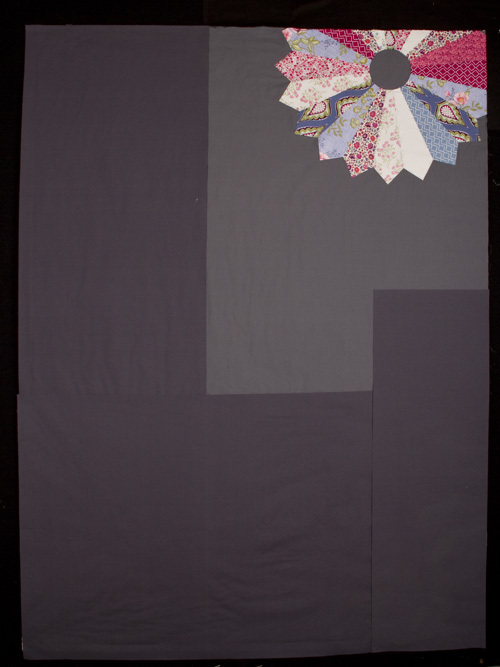 As you can see, I was lazy and didn’t feel like calculating anything, so I just put up the old quilt on the wall and kept cutting pieces of the grey until the whole thing was covered up. Pathetic! But it worked. Now I am ready for some couch time with the family. I like how the dresden is made with fabric that is traditional but contemporary looking and the gray background makes it look more modern. Hope that makes sense…I like it!!! Thanks Jamie Lee! That has definitely been my goal since I started sewing with my new fabric- to take fabric that is somewhat on the traditional side and use it in a more modern way. I’m so happy you like it! 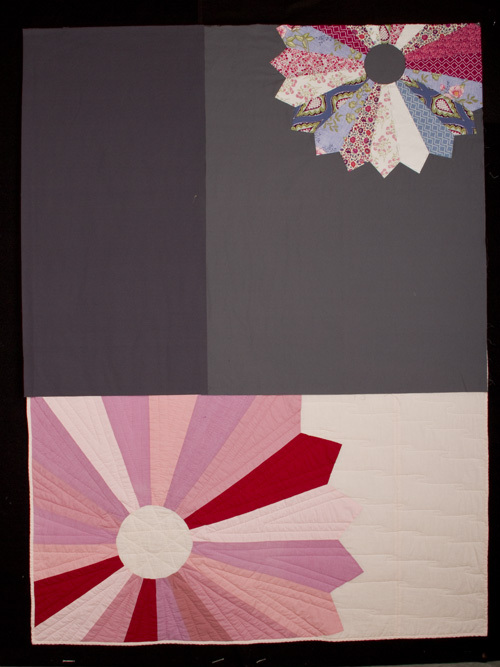 I *love* this quilt, Jessie (as well as the first dresden version that you did). 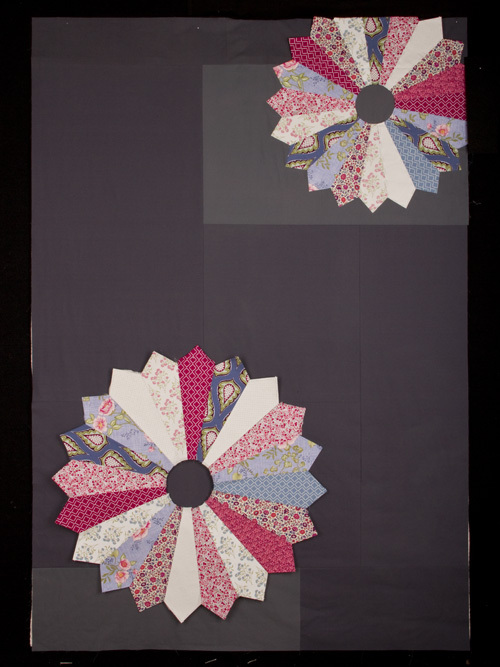 It’s such a great update of a traditional motif, and I especially like the multi-tone grey backing on this version! Thanks Casey! 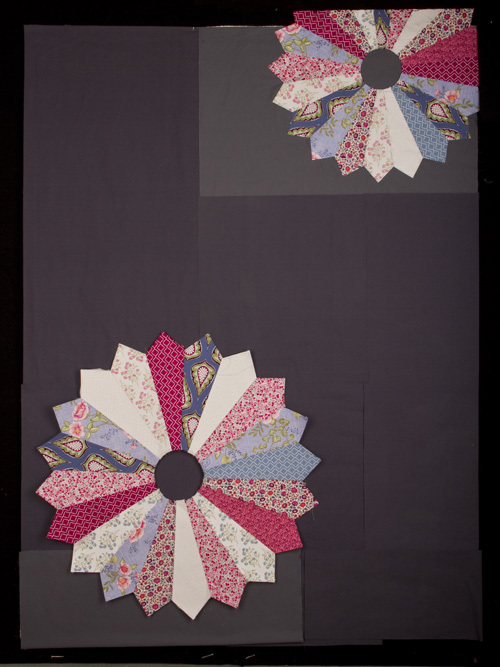 The background was one of those happy accidents- I thought it would be ok to start appliqueing the smaller flower to the lighter grey because I could go out the next day and get more… of course the store didn’t have any more but they had the darker one which I liked so much better! But I am not one for undoing any sewing, especially hand sewing, so I just worked both colors in! Inspiring me yet again! 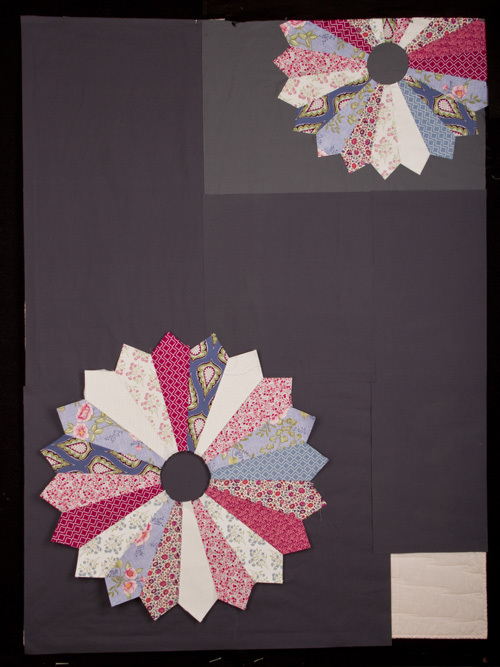 I’ve decided I need some hand-quilting for when I can’t get out of the recliner (most days)! I finally did a little sewing today and it felt so good…a diamond quilt top with pink flannels with my friend Anne during her toddker’s nap time. I thought I’d come home and start something for the little nubbin, but he decided I needed a long nap, and now he’d probably like me to get up and make dinner! So…maybe I’ll at least spend some time cutting out a quilt after dinner. Baby steps, so to speak! ;). Looking forward to seeing you next weekend! Good choice those Seahawks. : ). Pretty stressful game for us Washatonians. Your quilt is very nice. I gravitate toward softer background colors but I like how this looks. 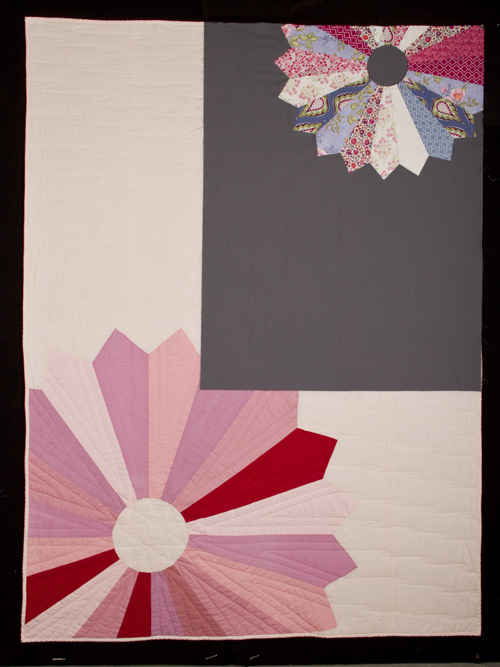 I love traditional quilts and have only do e a couple modern style. Thanks for always sharing. The two tones of gray make a powerful shift in the background that adds a depth to the space which was a good way to up date and make it look a tiny bit more complex than the original design. Your process of choosing where to use the lighter gray against the darker is very interesting to see. Thanks for showing how it evolved to the finish. Cheers it’s going to be magnificent and a lot of fun to stitch with TV. Hi Dorothy,I have used a lot of Superior thread but not their 12wt vegearatid so I can’t give you a direct comparison but their thread is not hand-dyed which, in my opinion, gives a more natural gradient of color. For instance, their yellow gradually turns into orange and gradually into red rather than having one inch of yellow, followed by an inch of orange, and then a inch of red. I also like the luster of the hand-dyed thread as well as the fact that it is colorfast.